In December last year, Tough Win crossed the finishing line of the Grand Prix Stakes just ahead of the previous year’s winner Mister Park and the two-year old phenom, Smarty Moonhak. Racing fans looked forward to a year when “The Troika” would do battle against each other for the biggest prizes the peninsula has to offer. Fast forward eight months and Tough Win is the only one left. Mister Park lost his life after a race in June and then less tragically last month, Smarty Moonhak was diagnosed with tendinitis following his defeat in the Busan Metropolitan Stakes. Tough Win has not been without his problems though,. 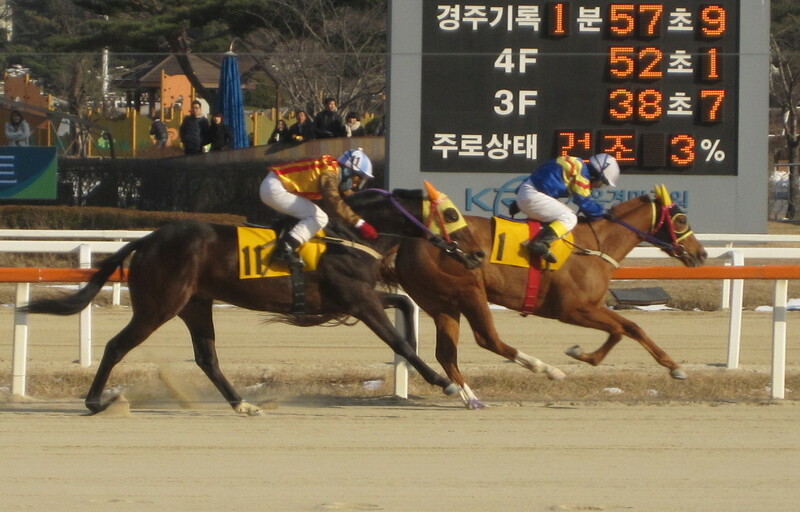 Suffering a bleeding attach in June, he was a long way of his best as he ran fourth in that same Busan Metropolitan but this Sunday, he’s back on home sand in the feature event at Seoul Race Park. If he’s at anywhere near his best, he will win although the ever dangerous Jumong is likely to give him a good race while it will be very interesting to see what young US import Haedongcheorwang (West Acre), with 6 wins from his 8 starts including 2 at the elite level already, can do with a big weight advantage against a really top class horse. It should be a fascinating race. Busan has a pair of class 1 feature races on Sunday while all three south-coast based foreign jockeys; Gerrit Schlechter, Narazaki Kosuke and Joe Fujii all have plenty of decent looking rides over the weekend. 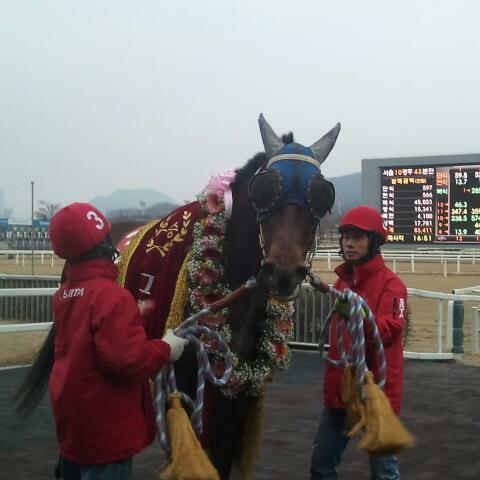 Rising Glory overcame the stubborn challenge of Cheoneun to win the 2012 Korean Oaks at Busan Race Park this afternoon. Cheoneun had led right from the start of the fillies’ Classic and, on the rail in the home straight, looked to have enough left in the tank to lead from gate-to-wire. 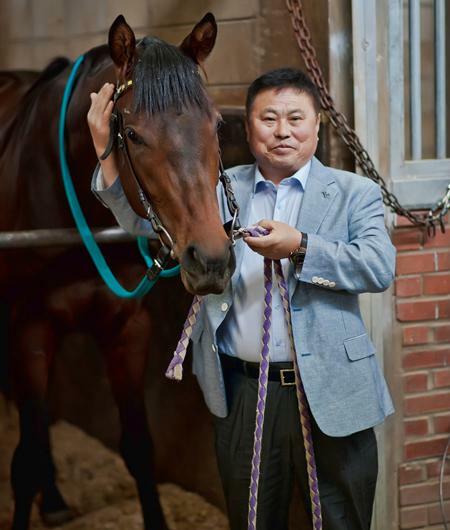 However, Rising Glory had always been handily placed and, under Jo Sung Gon, once she got her run, she hunted down Cheoneun, hitting the front with fifty metres remaining and stretching away for victory by just under two lengths. Grand Teukgeup, with South African jockey Gerrit Schlechter on board finished third but there was frustration for Japanese rider Joe Fujii. Riding 4/1 chance Nuriui Bit for Australian trainer Peter Wolsley, he was taken out of the race on the final corner by out of control 90/1 shot Last Love. Dragged right over to the stands rail, by the time Nuriui Bit was going in a straight line again, the race was long gone. Over Power, who punters sent off as the slight pre-race favourite, finished in fifth place under Narazaki Kosuke. As for the winner, Rising Glory, sent off fourth in the betting at 6/1, was taking part in her first Classic of the season having been kept away from the KRA Cup Mile and the Derby. In winning today, she was recorded her fourth career victory from nine starts. Her jockey, Jo Sung Gon celebrated in his usual less than understated way as they crossed the line. Jo was recording his seventh Korean Group race win although five of the previous six had come on one horse, Dangdae Bulpae. Rising Glory is the third Korean Classic winner for her sire Menifee from his two crops that have come of age He sired last year’s Oaks winner Useung Touch, while Gyeongbudaero took the KRA Cup Mile earlier this. So far, neither of those have gone on achieve true greatness with both being hampered by injuries. Whether Rising Glory comes to Seoul in October for the Minister’s Cup, the final leg of the Korean Triple Crown, will be the big question for her connections over the coming weeks. For now though, she is the champion filly of her generation. The Korean Oaks headlines a big weekend of racing on the peninsula. Fourteen fillies face off at Busan race Park on Sunday afternoon – click here for a full list of runners and riders. The wildly inconsistent Cheoneun – can she hit top form in the Korean Oaks? Also on Sunday the GCTC Trophy provides a second helping of Stakes action at Busan with imported fillies and mares getting a crack at a big race win. It’s been a really bad couple of months at the top-level of Korean racing. Back in June, last year’s Horse of the Year, Mister Park, fatally broke down in a race at Busan. On the same day Grand Prix champion Tough Win suffered a bleeding attack and was a shadow of his real self when he raced again a month later. Then Smarty Moonhak, the phenom believed by many to potentially be the best horse we’ve ever had here, was diagnosed with tendonitis. The latter two events were less tragic but it meant that the “troika” who filled the first three places in the Grand Prix and were expected to battle each other for big prizes in Korean racing’s most exciting year ever, was gone. We’re looking for a star. Dangdae Bulpae, winner of the Busan Metropolitan ahead of what we now know was an injured Smarty Moonhak clearly is one. Fifth that night was a three-year old American import called Smoking Gun (Hat Trick). Tonight he reappeared and absolutely destroyed a class 1 field over ten furlongs. Smoking Gun is by the Japanese born sire Hat Trick (Sunday Silence) and out of Announce mare Desdemona’s Dream. He won his first four starts, culminating in the Macau Jockey Club Trophy, before finally being beaten on is first try at class 1. Tonight He was eased to a five length victory over Darani (Saarland) with Nobel Pokpung (Didyme), second in the Korean Derby, a further nine lengths back in third. There’s a long way to go until the Grand Prix but on today’s performance, Smoking Gun will be there. May he stay sound. Smarty Moonhak has been diagnosed with tendinitis. Detailed veterinary examinations after the colt was unexpectedly beaten in the Busan Metropolitan City Stakes last month revealed the three-year old to be suffering from the same debilitating injury that earlier this year brought a premature end to the US Triple Crown bid of I’ll Have Another prior to the Belmont Stakes. The tendonitis is in Smarty Moonhak’s left-foreleg and he is to undergo stem-cell treatment in order to try to heal the injury. It’s a procedure that has been used successfully on racehorses in Korea before, most notably on Classic winner Baekgwang, who returned to racing after a lay-off of over a year after receiving the treatment on a slightly different injury. He went on to race for a further two seasons. The treatment course is likely to take six months and trainer Ko Ok Bong told the media that he hasn’t given up hope that Smarty Moonhak can race again. However, Korea Racing Authority Animal Hospital vets who made the original diagnosis cautioned that even if the treatment is successful, the likely of a reoccurrence is high. Three-year old Smarty Moonhak [Smarty Jones – Madeira M’Dear (Black Tie Affair)] burst on the scene last year, winning the Turkey Jockey Club Cup by 10 lengths and becoming the first two-year old to ever qualify for the season-ending Grand Prix Stakes. He finished third in the 2300 metre Grand Prix and was unbeaten this year before his surprise defeat at the hands of Dangdae Bulpae in Busan last month. He has eight wins from eleven starts and career earnings of just over half a million dollars. The most exciting horse on the Korean peninsula, Smarty Moonhak had also earned an overseas following by virtue of being a son of the wildly popular Kentucky Derby and Preakness Stakes winner Smarty Jones. Smarty Moonhak’s career-threatening injury comes as a major blow to Korean racing which earlier this year lost 2011 Horse Of The Year Mister Park (Ecton Park) after he broke down during a race. Smarty Moonhak’s owners have assured concerned racing fans that while no effort will be spared to get their horse to race again, his post-racing future is secure. Night racing draws to an end this weekend as Seoul, Busan and Jeju all play host to their final twilight cards of the year. 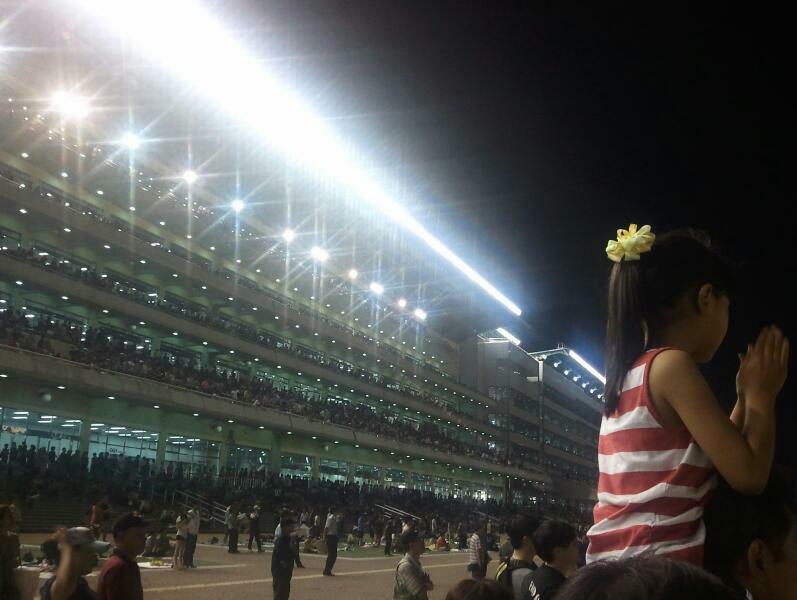 Evening racing at Seoul is for everyone! There’s no Stakes racing this week but still plenty to keep us occupied. Feature races at both Seoul and Busan are on Sunday. In the capital, Prime Galloper (Strodes Creek) is on a four-race winning streak and will be favourite as he faces nine class 1 rivals, headed by Singgeureounachim (Exploit) over 1900 metres. Meanwhile at Busan, it’s imported horses who take part in the big race. Smoking Gun (Hat Trick) did well to finish fifth behind Dangdae Bulpae and Smarty Moonhak in the Buan Metropolitan City Mayor’s Stakes last month and has every chance of getting back to winning ways in a competitive race over 2000 metres.